Note: Michael Joyce's book 'Football League Players' Records 1888-1939' and The English National Football Archive website show him as John (Jack) James Bell, born in Basford on 2/3/1891, but there is evidence to suggest he was John (Jack) Joseph Bell, born in Nottingham on 31/7/1890. Curiously, as well as locations in Staffordshire, Shropshire and Cheshire, Basford is also a suburb of Nottingham. Bell began his career playing for his regiment, the Sherwood Foresters, before spells with St Bartholomew's and Christ Church. 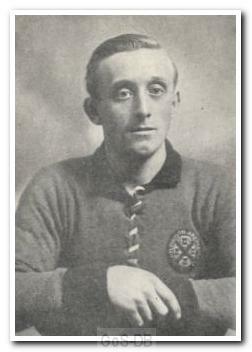 He had a trial with Nottingham Forest in 1909 and then played for Sutton Town and the Royal Engineers before signing for Reading in 1911. A versatile forward who could play at inside-right, inside-left or centre-forward, Bell moved to Home Park in July 1912, the club handbook describing him as "dashing and fast, a splendid goal getter". In 15 months with Argyle he struggled to break into the first team and in October 1913 returned to his hometown, signing for Forest. He scored 6 goals in 54 league games over the next two seasons before the outbreak of war interrupted his career. When hostilities ceased he had brief spells with South Shields, Merthyr Town, Grimsby Town and Loughborough Corinthians before signing for Rotherham County in 1922. He spent 18 months with the club, scoring twice in 15 appearances before ending his career at Hartlepools United. After being released by Rotherham at the and of 1922/23, this Jack Bell played Southern League football at Weymouth in 1923/24 and at Torquay United in 1924/25. The age quoted in the WMN article is wrong.